First of all, my apologies that I didn't write a blog post on Monday to let ya'll know how my weigh in went, nor did I write a single thing all week about jack squat. Work, work, f'ing work. That pretty much sums up a lot of things and the reason I didn't write, and I'm honestly so tired of having bad days and bad luck. The sad thing is, the week started off ok. I lost a smidge over 8 pounds, which is nuts and I'm sure was just mainly water weight but at least it's going in the right direction! My food stuff is still okay, but sort of a work in progress. Most days I did pretty well, but there were 2 days that I went totally nuts and went like 200-400 calories over my metrics. Again, work caused a lot of emotional reactions that didn't exactly help me stay on point. Doesn't make it right I guess, but makes me human and is just reality. I am proud that I continued to track my food even when I was doing poorly, which is something that I usually don't do. I feel like seeing some of the consumption in print kept things from being worse than it could have been. My fitness stuff sucked too. I did yoga on Monday and didn't do it again at all for the rest of the week. I also didn't run during the week. I had my bag packed at my desk with all my crap, but do you think I used it? Nah. I definitely felt and feel low that once again I let that place upset me to the point of throwing away my own needs. It certainly wasn't worth it. It never is. Thank God the weekend came along, and I had all the time in the world to focus on me today and to have a nice run. It's also officially chilly now, and nothing made me happier than to put on my long sleeved marathon finisher shirt and my gloves, which I can't remember the last time I put my gloves on! I set out saying I wanted to do 7 miles, but decided to do what made me happy, which ended up being 4 miles. I had the time to do more, but this was literally my first run since my summer training and the 2 big races. I just for once wanted to go out and have fun and not feel upset or pressured by a training run. And I did. I ran around Intel for the first time in a long time, which is where I did my 20 mile run at the end of September (ie 100 years ago). I just remember how long and torturous that day was, how I was fighting blisters on my feet and other unmentionable places, that it was raining the whole time and I was so hungry. Today was very different! It was dry, cold and I was out there because I wanted to be. And truthfully, it felt like the run was over so fast even though it took me almost an hour (I really gotta start working on speed). Losing even the small amount of weight I lost this week helped me, because the run felt effortless at times. Running is such a weird thing. Lots of times it can be gross, upsetting, frustrating or downright torture. And then sometimes it's exactly what you need to feel good. I needed it today. I put on that finisher's shirt this morning and remembered that yes, I completed a marathon this year and felt incredibly proud in that moment. The girl who was barely running 3 miles this time last year ran 26.2 miles this year. 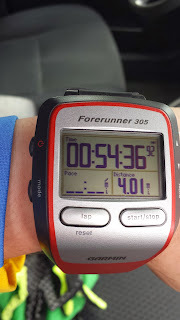 Then when I ran my 4 miles today, I thought of it as a "short run". However when I ran 4 miles for the first time in January of this year, I remember being like "whoa, I'm kind of a BFD". The change in my mindset when it comes to running now is crazy. Those are the times that running is wonderful, uplifting and awe inspiring. What running gave me today was something I desperately needed, which is to feel like sometimes hard work does pay off. When it comes to running, if you put X amount of effort into it, X results happen. I have put effort in over the last year and have achieved things with running that I never believed I could do. Looking back on that makes me feel so good. I wish I could get that kind of satisfaction and happiness from my professional life, and I wish that hard work and effort had the same payoffs in the corporate world. At least I have running to fulfill that need. I mean, that's real life. That just happened. When I saw it I was just like, however much it costs I'm paying it, and whatever size it is, I'll be anorexic just to fit into it. 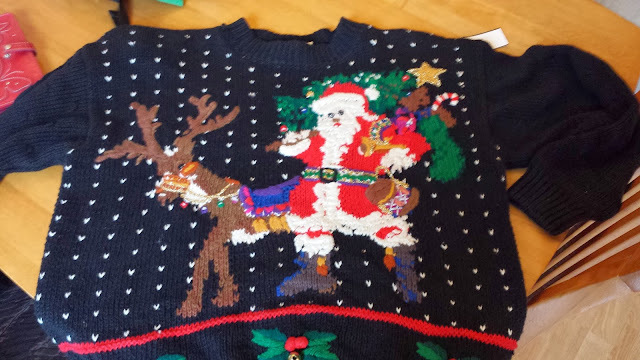 Thankfully it's just my size, as though the ugly sweater gods were watching over me. (It was also a very reasonable $7 which was just about the price I was willing to pay). It has jingle bells on it, so I will be tacky AND festive, which I greatly enjoy. The only thing I am worried about is that it's HEAVY, and considering how hot natured I am, the sweater will probably piss me off by the end of the race. I guess I could cut the sleeves off, but it seems wrong to sully such a pristine work of art. Hopefully it's super cold next weekend, and that way I won't die of heat stroke from wearing that thing!